SAN DIEGO (Tuesday, October 24, 5:30 pm PDT): In overweight and obese people, fat often gets deposited in the midsection of the body. Large amounts of this belly fat can lead to unhealthy changes in a heart’s function and size. But according to new findings presented at the American College of Surgeons Clinical Congress 2017, a bariatric surgical procedure, and the weight loss that follows it, actually allows the heart to return to its natural shape and function. When a person lifts weights, pushing against resistance, their muscles eventually get bigger. The same is true for the heart muscle. When a person is overweight, the heart has to generate more force to pump even more blood throughout the body. This extra workload causes the heart muscle to grow bigger. But contrary to what some people think, a bigger heart muscle doesn’t mean a stronger heart. In fact, the larger the heart, the less efficacious it is at fulfilling its functions. For this study, researchers at the Cleveland Clinic reviewed data on 51 obese men and women who underwent bariatric surgery between 2010 and 2015. The analysis included factors such as BMI and coexisting health problems. 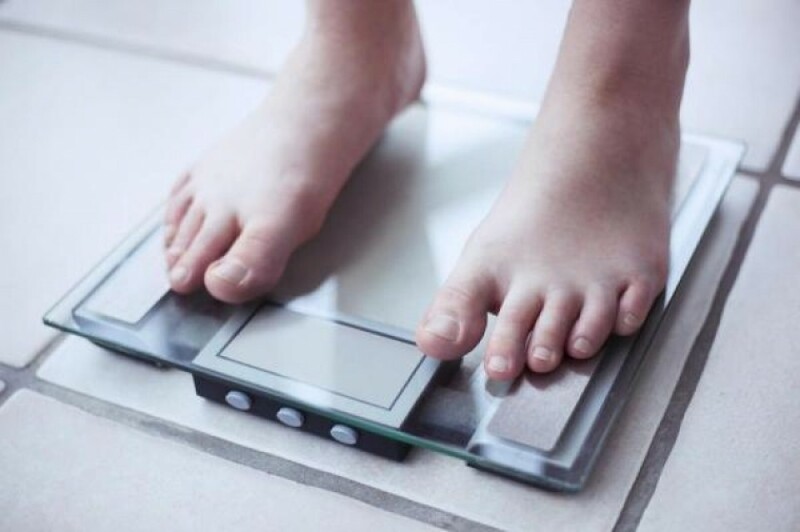 The average age of the patients was 61years and the average body mass index (BMI) was 40, which means that the person is about 100 pounds overweight. To better understand the impact of a bariatric operation and weight loss on heart health, the researchers compared preoperative and postoperative echocardiography readings. An echocardiogram is an ultrasound of the heart that measures not only its size and geometry, but also its function. An echocardiogram measures how much blood is in the heart, how much blood goes out of the heart, and how much blood remains in the heart. Larger chambers lose some of their pumping power. This loss means that more blood stays in the heart, and ultimately increases a person’s risk of heart failure. This study is the beginning of a series of studies that will be conducted by these researchers over the next few years. They will perform follow up studies to find out what the window is in which losing weight allows the heart to go back to its normal geometry. 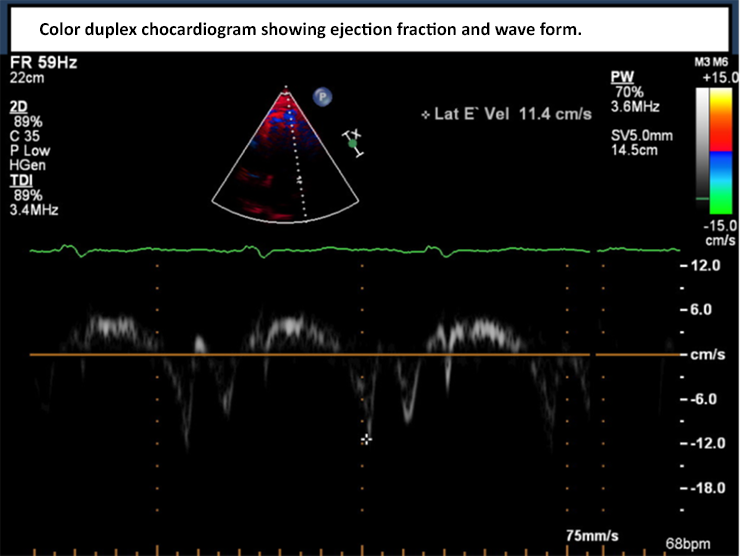 Image A: Echocardiogram showing ejection fraction (EF) of 70 percent. EF is a measurement of the amount of blood being pumped out of the left ventricle (LV), the heart’s main pumping chamber. A LVEF between 55 and 70 percent is considered normal. 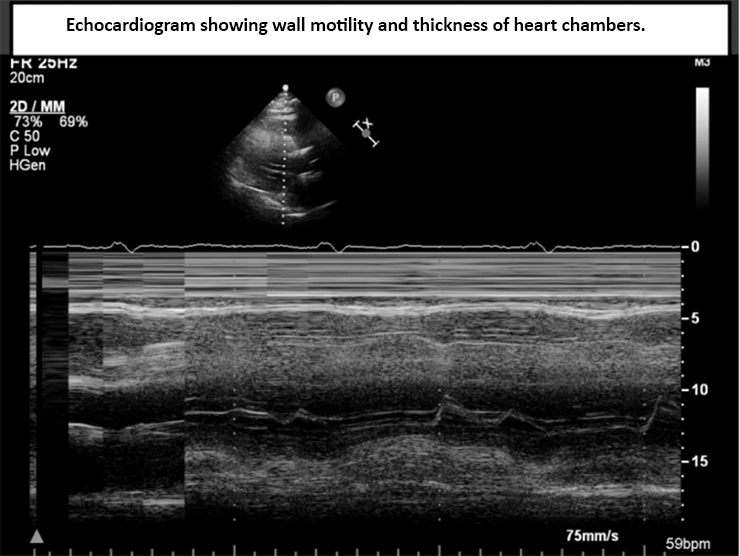 Image B: Echocardiogram showing wall motility and thickness of heart chambers. Other study authors, all from Cleveland Clinic Florida, are Rajmohan Rammohan, MD; Nisha Dhanabalsamy; Emanuele Lo Menzo, MD, PhD, FACS; and Samuel Szomstein, MD, FACS. “FACS” designates that a surgeon is Fellow of the American College of Surgeons.